Here are the 5 rovings I made for the store Wooly Belle, in Vinton, VA.
I’m kinda jealous, and as always, I want to keep them all for myself, but they’re headed to the post office tomorrow morning. From left to right we have Vixen, Toxic Mayhem, Rose Garden, Moss, and Tiger Lilly. 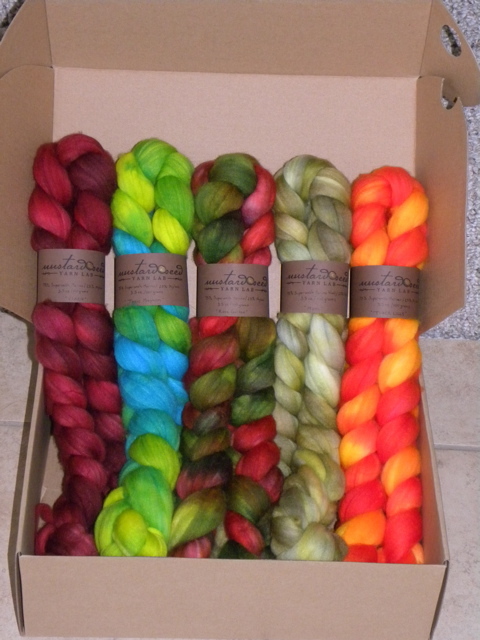 Each is Superwash Merino wool and nylon. I think Moss is my favorite one. Feel free to leave a comment and tell me which is YOUR favorite. I sure hope the fiber lovers in Vinton like them too! OH! THey are SO beautiful! All of them. I love Tiger Lilly – I had a dress just those colors – called it my “power dress”. I don’t know how you can stand not seeing what they will look like when they are spun! You should be SO SO SO proud of yourself, Danielle. I know I’m proud of you! I think Vixen is my favorite. Such a beautiful red. I love the rose garden and the Moss and the vixen and the toxic mayhem and the tiger Lilly, Haha….. I know that is all of them! I totally get it how you feel like keeping them. They are Fantastic, I so wish we lived near each other b/c I would love to learn how to do they dying and knitting. Sheree, you should have mom teach you how to knit when you are in FL the 3 days before we get there! And thank you!